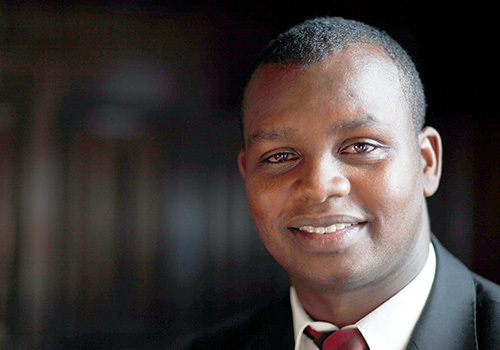 Based in Kigali, Freddy is Regional Director for East Africa. Freddy has led the development of Aegis’ peace education programme in Rwanda and is now leading Aegis’ work to take this model beyond the borders of Rwanda to areas at risk, including the Central African Republic, South Sudan and Kenya. Joining Aegis in 2004 during the construction of the Kigali Genocide Memorial Centre as a team leader responsible for genocide documentation, he was appointed Country Director in 2006. Freddy had trained as a teacher, securing a Bachelor’s Degree in Education from the Kigali Institute of Education. He survived Rwanda’s 1994 genocide as a teenager, and as an orphan head of household, he worked his way through school to become a leading advocate for peace and human rights education, helping to found AERG, Rwanda’s student survivors association, and going on to become Secretary General of IBUKA, the national umbrella association for Rwandan genocide survivors. Also an International Board member of the Centre for Justice and Reconciliation in Cambodia, Freddy lectures internationally on the impact of the genocide and on post-conflict reconstruction.